"Preparing lamb at home doesn't have to be intimidating. 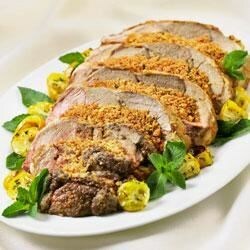 Try this effortless yet delicious stuffed roast at your next family gathering. To further simplify the preparation, ask the butcher to butterfly the leg of lamb for you." Preheat oven to 325 degrees F (160 degrees C). Toss bread cubes with cheese, mint and chili sauce until well combined. Lay meat fat side down and sprinkle all over with salt and pepper. Spread evenly with bread mixture, leaving a 1-in (2.5-cm) border at one end. Starting at the narrow end, roll up meat jellyroll style. Tie rolled roast together with kitchen string. Transfer to a rack set in a roasting pan and roast, basting occasionally, for 1 1/2 hours or until a meat thermometer inserted in centre of meat registers 140 degrees F (60 degrees C) for rare or 160 degrees F (70 degrees C) for medium doneness. Rest roast for 10 minutes. Slice thickly. Makes 8 servings. Twist 1: For an elegant family meal, serve with roasted potatoes, seasonal vegetables and additional chili sauce on the side. Twist 2: For easy preparation, use skewers to keep the rolled lamb in place while tying with the string. Twist 3: For a cheesy twist, use Swiss, Gruyere, or Asiago cheese. Twist 4: For herb variations, substitute fresh oregano or thyme for the mint leaves.